As part of an enterprise backbone or as customer premises equipment (CPE) to service provider-managed network services, the MC3810 reduces operating costs and complexity and increases network throughput and performance. Interoperable with the broad Cisco networking portfolio, the MC3810 (MC3810-V and MC3810-V3) is a practical investment in today's networking requirements and a strategic investment in converging data, voice, and video applications. The integration of data, voice, and video onto packet- or cell-based multiservice networks is a key direction for both enterprise and service provider infrastructures. In enterprise environments, emerging applications, such as LAN telephony, and the attraction of combined voice/data budgets are driving a new wave of data, voice, and video convergence. In service provider environments, new competitive pressures and the opportunities of new enterprise service demands make the flexibility and efficiency of multiservice infrastructures a compelling proposition. As the "smart" entry point to any network, the MC3810 combines data, voice, and video in the most efficient, flexible, standards-based way possible, at a fraction of the cost of previous-generation, simple multiplexers. 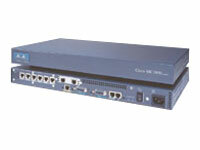 Based on Cisco IOS network-wide software, used in Cisco products from campus ATM switches to Internet backbone routers, the MC3810 is a natural extension to any Cisco network environment.